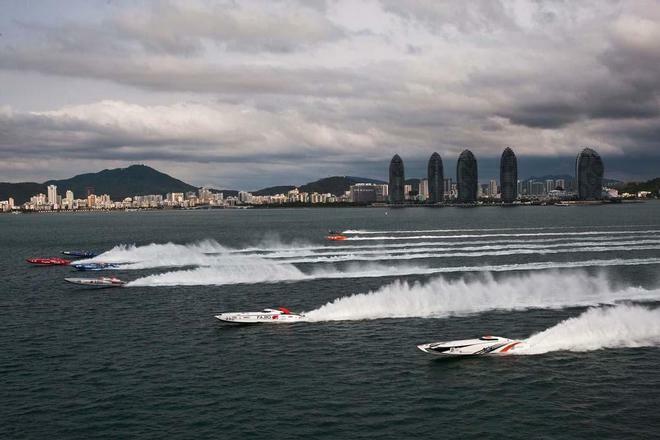 At the Sanya Grand Prix, Victory’s Arif Al Zaffain and Mohammed Al Marri made the perfect start to their title defence with a convincing win in race 1. 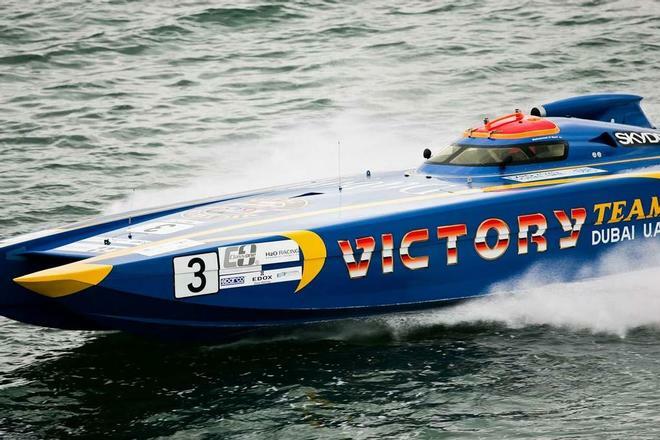 The defending Champions had to come from behind after being outgunned at the start by Zabo-Isiklar’s Ugur Isik and Christian Zaborowski, who led the Victory duo into the first turn to lead by three seconds at the end of the opening lap. Behind the race leaders the LFFendi10 crew of Luca Formilli Fendi and Giovanni Carpitella made the jump on Victory Australia’s Darren Nicholson and Class 1 newcomer Ross Willaton to move up a place from fourth on the start line. The race outcome hinged on two opposite race strategies, Zabo-Isiklar opting to take their mandatory short-lap early, on lap 2, and a brilliant midrace stint of the 11-lap, 51.51Nm race by the defending World, Middle East and Edox Pole Position Champions, and their decision to go late with their short-lap on seven. LFFendi10 followed the move by Zabo-Isiklar to get ahead of Victory who suddenly found themselves 27 seconds adrift of the leaders. Victory immediately began to push and regained second spot on lap 4, with the deficit cut to 12 seconds two laps later. On lap 7 Victory took their short lap to come out well ahead of Zabo-Isiklar and turn the deficit into a 23 seconds advantage. The Sanya shuffle saw throttleman Giampaolo Montavoci switch back into Poliform to race with Class 1 debutant Salim Al Adidi, and Tomaso Polli step out to take the sticks beside Faleh Al Mansoori in Team Abu Dhabi – the two Italians enjoying mixed fortunes. Montavoci and Al Adidi’s race ended early, with Poliform towed off the course on lap 2 with technical problems, Polli and Al Faleh going the distance and producing a very credible performance to finish in fifth place ahead of another solid outing by Gian Maria Gabbiani and Luca Nicolini in FA.RO ACCIAI. There was disappointment for Alfrdeo Amato and Miles Jennings in LFFendi8, retiring on lap 2 and more frustration for Marit Stromoy and Pal Virik Nilsen in Visun Sanya who hit problems before the start and returned to the pits. 1. 3 Victory Team – 20pts 2. 91 Zabo-Isiklar – 15pts 3. 10 LFFendi10 – 12pts 4. 7 Victory Australia – 9pts 5. 5 Team Abu Dhabi – 7pts 6. 23 FA.RO.ACCIAI – 5pts.